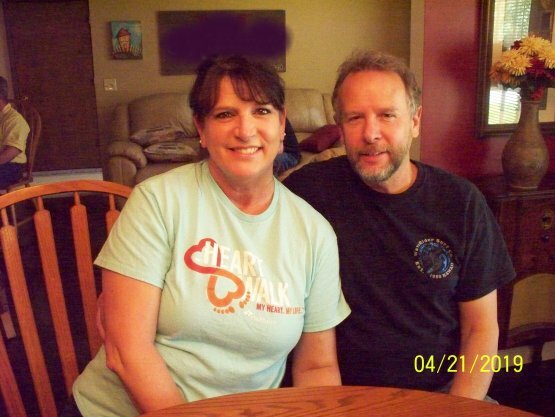 Our Daughter #1 invited Hubby and me to her house for an Easter dinner. This was a real treat for us because we usually spend most holidays by ourselves. 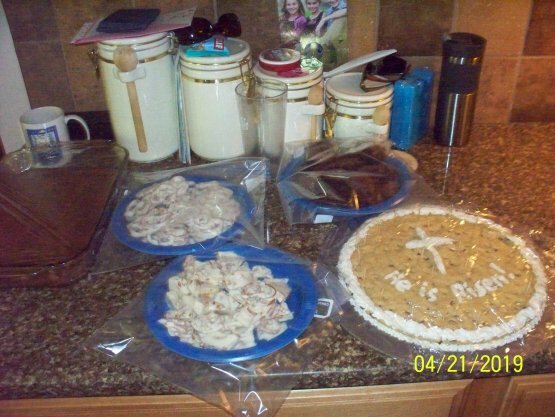 Plus it was an opportunity for me to do some baking and goodie-making! All day Sat. I was in the kitchen making good things to eat — chocolate-covered pretzels, brownies, a big chocolate chip cookie/cake, a cheesecake, and deviled eggs. We arrived just in time to eat. 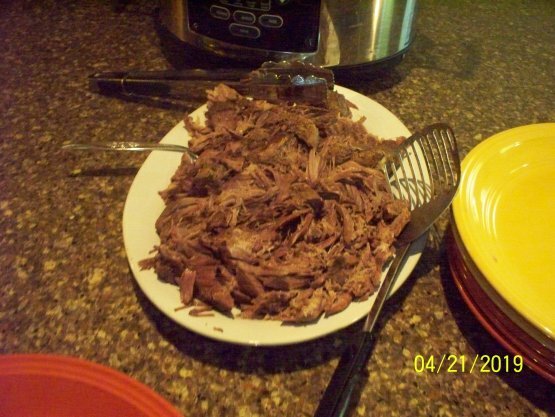 They had a roast in the crock pot that had been cooking since the night before. It was soooo tender that Son-in-law could hardly get a grip on it to take it out and put it on a platter. Along with mashed potatoes, gravy, green beans and the deviled eggs, the meal was so good that we had to wait a while before we had “room” for all the desserts. they went looking. 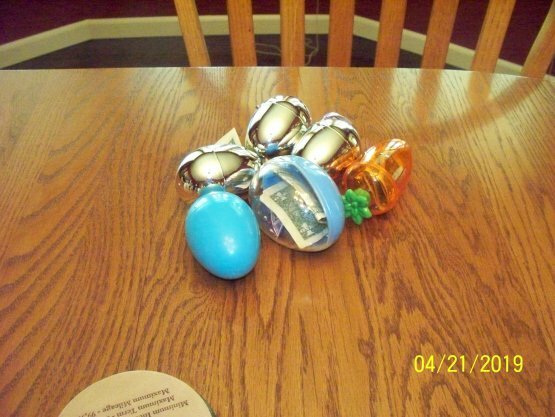 One of them found an egg and opened. Out popped some money! They both went in earnest looking for eggs then! Hey, Grandma knows how to get “boys/men” interested in playing. Ha! 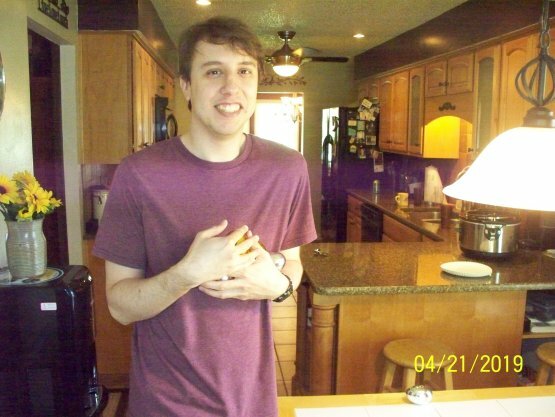 We all had a nice afternoon eating goodies, visiting, and taking some memory pics. It took me a while to come to the point that I needed to part with them. So Hubby and I took them with us to give to the boys if they still wanted them. 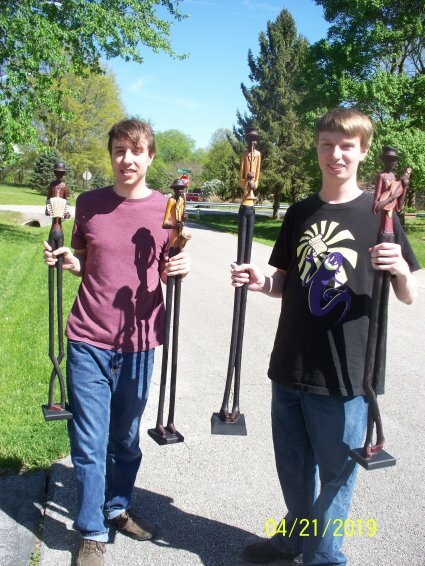 Now my musical men have a new home where they will be loved as much as they were at our house. It was one of the prettiest Easter Sundays that we’ve ever had, weather-wise. 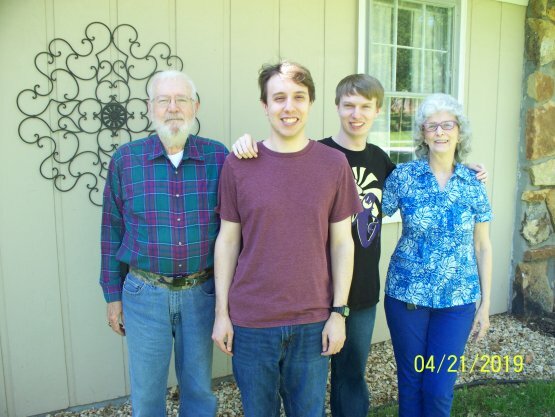 And it was one of the nicest spent with some of our family that we’ve had in a long time. Sis and I have been getting back into our routine of estate sale hopping and crafting once a week after all of our distractions from the previous couple of months. 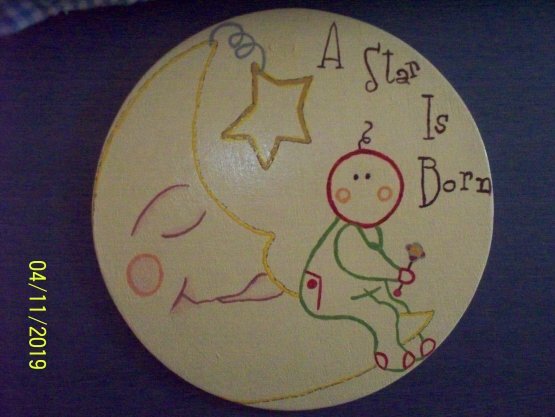 We started on a craft project several weeks ago that has somehow taken quite a while to finish. Well, I think I know what the “somehow” is — we’ve been going to so many sales each week that we haven’t had a lot of time to work on crafts after getting back to the house. Some days we didn’t even have time to drag out our craft-in-progress to figure out where we were on it so we could begin working before it was time for Sis to head home. Especially since we had “show and tells” to show off and talk about first, in-between eating our snacks. Well we finally finished, for the most part, our long, drawn-out project. Yesterday we only had one sale to go to so we had all afternoon to work on our door hangers. I worked on the Santa and Sis, the snowman. They’re made with felt in the same way that we made the stockings a couple of years ago. 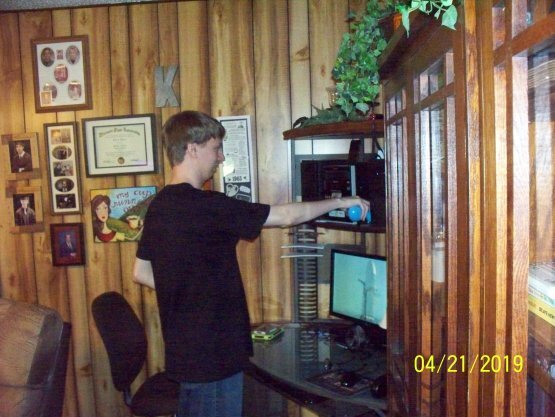 (Wow, that was a couple of years ago?!) I may or may not add a little trim around mine and then I need to cut the “X” for the doorknob to fit through. Sis still has a few sequins to sew on, maybe the trim, and cut the “X” in hers as well. She took hers home with her to finish up and will bring it back next week for a final pic. Aren’t they just the cutest? And we’re finished with them! We can move on to something else now. Speaking of “show and tells”, most of my “show and tells” have been unfinished. Not real “show and tells” so I cheated when I jumped the gun and showed them. Yes, I’ve counted at least six projects that I’ve started in the last few weeks. But I won’t show them on here until they are finished! So that means I’m going to have to have a huge UFO finishing session one of these days. However I’ve finished one, so here it is. 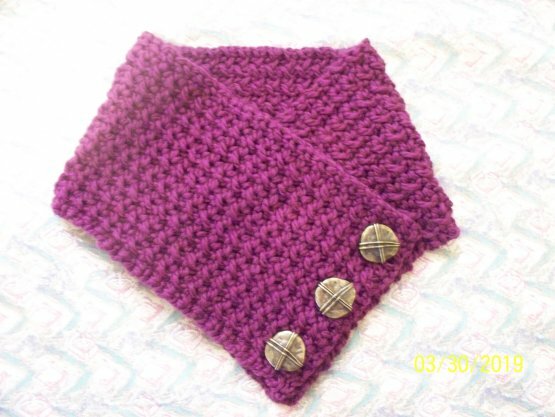 It’s a crocheted cowl. The buttons I chose were too big; so, since I’ve taken this picture, I’ve picked out some other buttons a little on the smaller size. 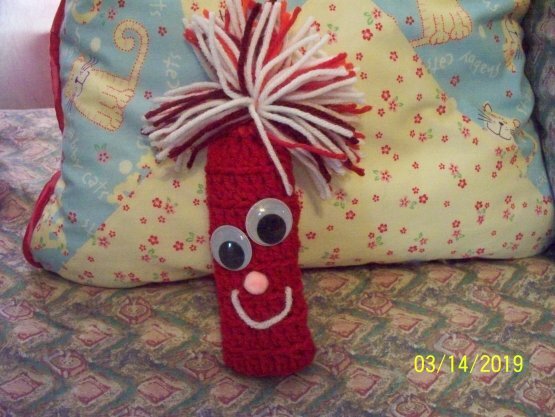 I have enough of this yarn to make another one so it’s now in a wannabe sack waiting on me. 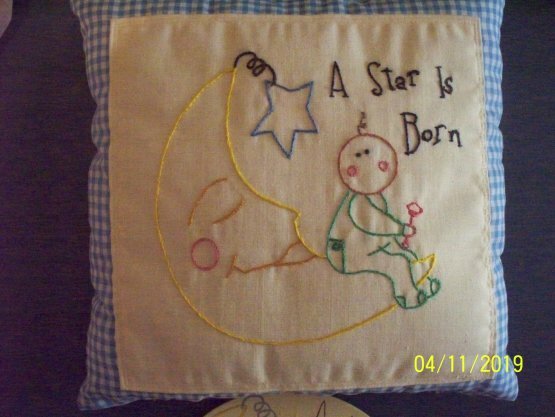 Sis brought over a couple of crafts to show last week. 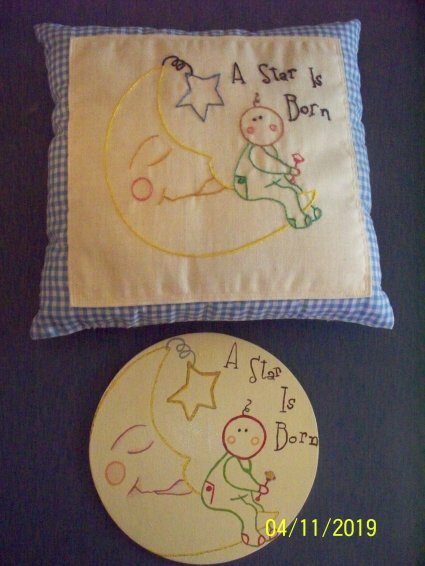 She embroidered the pillow and painted the little disk to match. Isn’t that just the cutest? Our biggest “project” that has been under way for both of us, is getting ready for another yard sale. We’ve been going through drawers, closets, etc. trying to make more room for all these items we keep bringing home from estate sales. Our tentative plan for this sale is May 2, 3, and 4. Once we get this yard sale out of the way, we can get back to our crafting in earnest. Or in this case, put them on. I posted the first set of gloves in my last post. I had started them before Christmas, I think, and then birthdays and Christmas came along, so into the UFO basket they went. 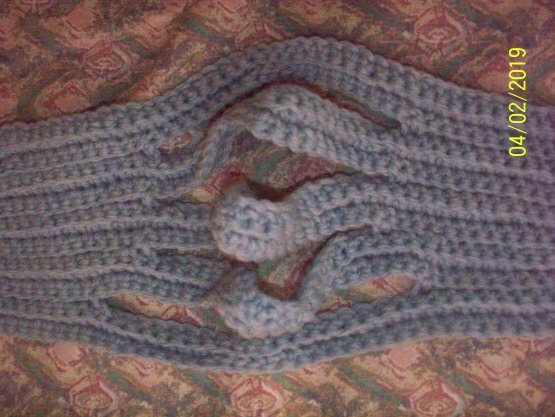 All the crocheting was done, I just needed to sew them together. After getting them out and finishing them, I loved the way they turned out and felt on the hand. Wool is so warm and I couldn’t believe how comfortable they were. The pattern is so easy to do and with all this new wool I’ve acquired lately at estate sales, I’ve become a little obsessed with making gloves. 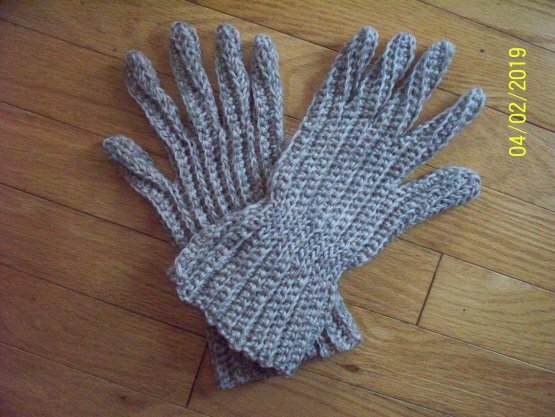 I’ve made knitted gloves before, but they were kind of a hassle because of all the fingers — cutting yarn, tying it off, weaving it in, then starting another finger, etc. Not fun. 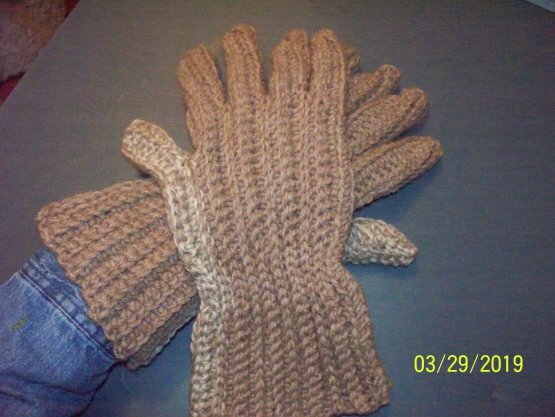 When I found this pattern, (not sure where I got it because it’s just a copy from a book or magazine, probably from the library), I wondered how the gloves would look made up because the pattern looked simple enough. It starts out by chaining 82 stitches. What?!? That’s a lot of stitches. 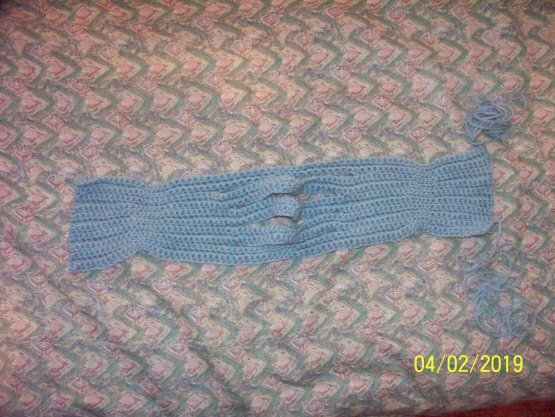 But as I crocheted, it started making sense. The gloves are made from wrist to the end of the finger and back again to the wrist. After the thickness of the finger is made, then the pattern instructs you to chain again for the next finger and the next, etc. By the time you have the glove finished, you’ve gone from one end of the wrist to the other. No cutting yarn, tying off and weaving in ends. 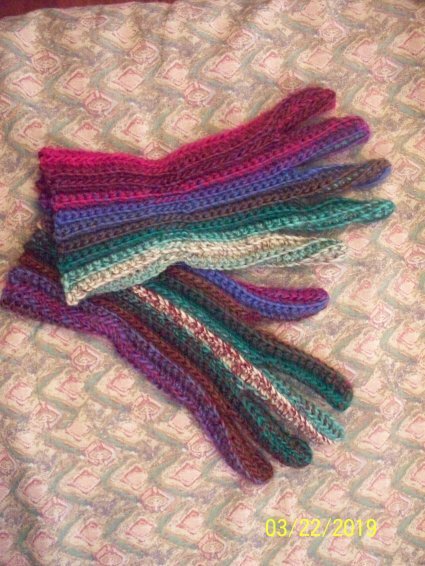 Here’s what one glove looks like when the crocheting is finished. All that’s left to do is fold the glove in half, sew around the wrist and fingers and it’s finished! I’ve made five pairs of gloves so far. After searching through my own stash of wool yarn, I found a few more skeins that I picked up on clearance a while back. So out they came, and I have enough yarn to make 10 pairs of gloves! This pair is a little funky because I ran out of yarn so had to use some left-over from another pair. See how the thumb is a different color? Is it just me, or am I the only one who thinks this look is kind of cool? 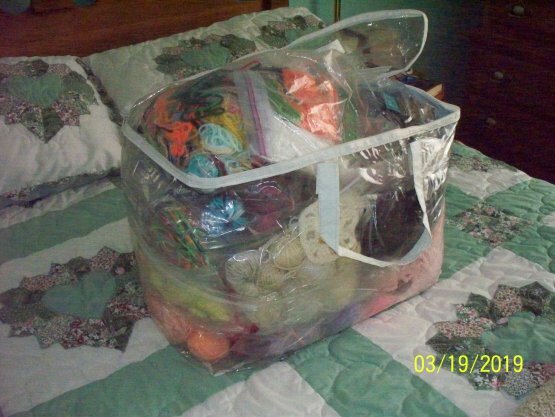 I might do this and use up more of those thousands of balls of scrap yarn that I have. Hop on board and let’s make another afghan! It’ll be fun! 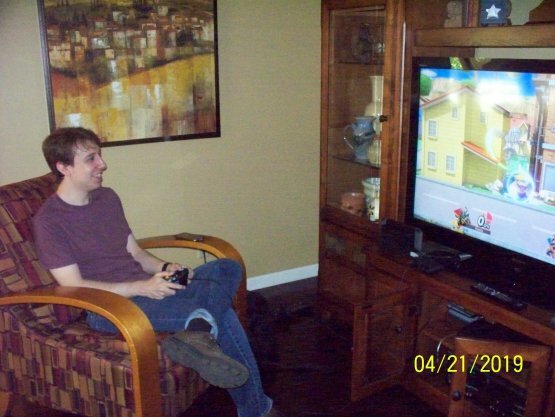 Sis and I have finally been able to get back into our routine again the last couple of weeks; however it turned out that I had to go to her house last week. The utility people decided to replace the utility pole next to our drive-way; so consequently, they parked their big truck right in front of our drive-way. Of course this had to be the day that Sis and I wanted to go estate-sale hopping and crafting. So instead of Sis coming over to my house and having to park her car in my drive-way while we took my car and did the running around, I had to make the men move their truck so I could get out and go pick up Sis. Of course most of the sales were on my side of the city, so I had to pick up Sis, then run all over to sales, then take Sis back home again. We decided that I would just stay at her house and do our crafting. I’m not sure if I’ve mentioned in past posts what we’ve been working on or not, so I’ll mention it again. 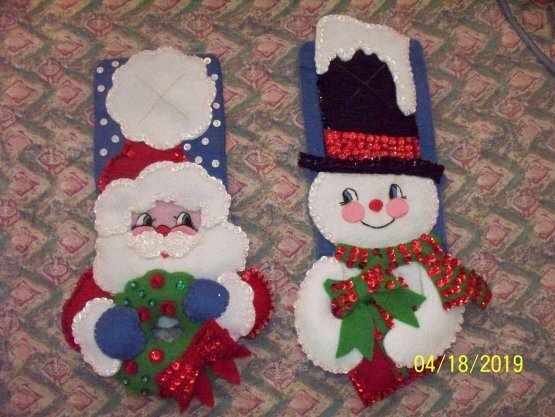 I had a kit that made a couple of Christmas door hangers made in felt — like the stockings that we made a couple of years ago. For some reason, (running to estate sales, eating, talking), we haven’t been getting very far along on them. We only work on them when we’re together, otherwise they would have been finished a long time ago. I’ll have a pic of them one of these days. In the meantime, here’s some “show and tells” that Sis has been working on. 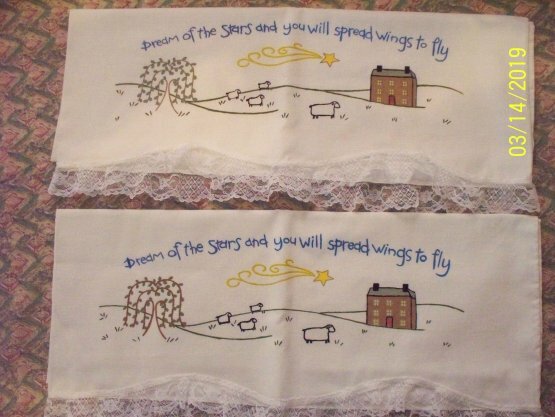 These are the pillow cases that she painted and brought over to show a few weeks ago. We thought they might look better with some lace on the end of them. Yep, I think they look finished now. 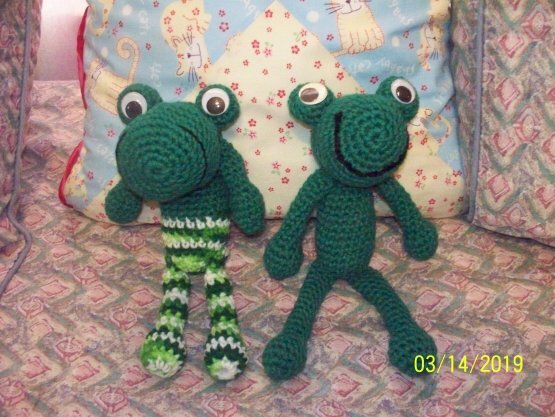 Sis has been into making little animals and brought the green frog over to show one week. Then she decided to make another one with some funky pants. How cute is that? 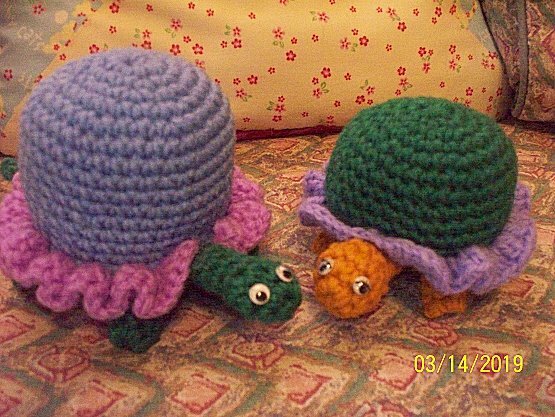 She made another turtle as well. After working on dolls for so long, I had a lot of small balls of yarn left over. So one day I was messing around and decided to make something from some of it. This is a character(?) that goes on the end of the handle of a broom to reach and get down cobwebs that always seem to appear in the corners of a room. I thought this would be a good way to get rid of some of those thousands of left-over balls of yarn that I’ve been accumulating for years AND have something new to sell at our craft booth this fall. Ya think anyone will want one? Well, I think he’s cute, as well as functional. Speaking of left-over balls of yarn. My big stash of left-overs are beginning to bust through the big bag that I keep them in. In fact, I’ve started another sack of them. I NEED to do something with them. 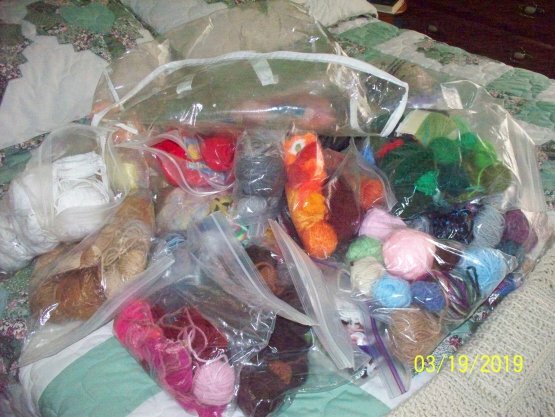 I’ve made a lot of afghans from left-overs in the past, so I’ve been leaning toward that goal. 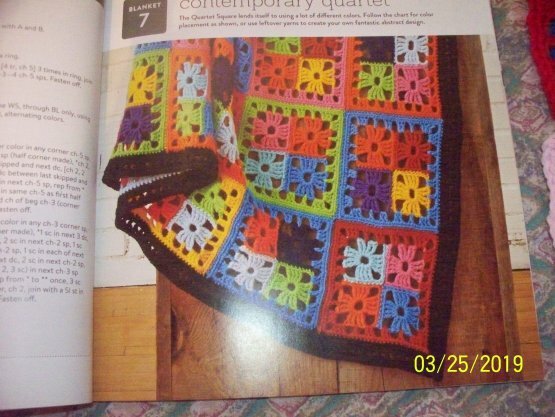 This book is titled “10 Granny Squares/30 Blankets” by Margaret Hubert. 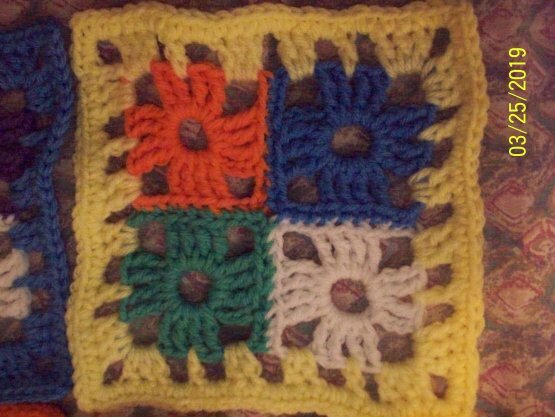 Still granny squares — but different. LOTS of cutting and tying off ends. Not my favorite thing to do. But it really is a pretty afghan and it’s using some of the smallest balls of yarn that I have. So I’ll carry on. 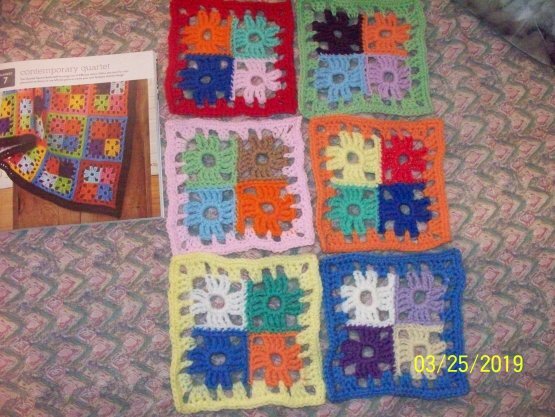 After making six of these squares, I started the o’ fizzling out routine again. So I went through some of my UFO’s to see what I should try to finish up and quit starting something new all the time. 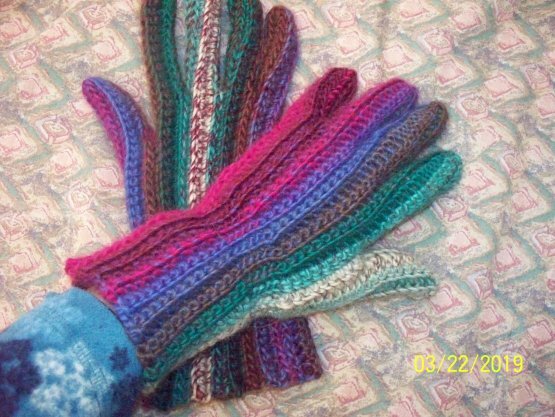 I found a pair of gloves that I started last fall out of some of the pretty yarn that I bought at another sale earlier in the year. It’s a wool yarn. One glove was finished but not sewed together. Never used this pattern before so I wasn’t sure how it would turn out. I got busy and sewed it together and I love it! It’s soooo warm and fits me to a T. I had the other glove made in no time. Of course finishing UFO’s got pushed to the back burner — again! Yep, when I get into something I’m enjoying, I tend to get carried away. But, hey, who can’t use another pair of warm gloves when the cold winds start blowing again, right?